As the men descended on the bar and ordered pints, the young Portuguese in their midst was gently teased. Earlier in the week he had mentioned some impressive contacts in European football while his business card carried the Barcelona crest. His new-found friends feigned reverence. Scotland’s west coast was not accustomed to such dignitaries, they joked. “Some of the lads thought he was maybe a kit man or something,” says David Gemmell, part of the group taking their Uefa coaching badges in 2000. “It was around the time internet machines were starting to appear in pubs. You would pop a quid in and get 15 minutes or so online. “Jose dropped in a coin and brought up the Barcelona website. The page loaded and there was a picture of him among a group of about six coaches, with an arm draped around Louis van Gaal. They were drinking in Largs, a quiet Ayrshire resort whose characteristics are a wide promenade, rival ice cream parlours and a top-heavy age demographic. And, for many years, the location of an unlikely rite of passage for Europe’s future top bosses. Take the start of the 2011-12 season. As the Premier League got under way, nine of the division’s managers – Sir Alex Ferguson, Sir Kenny Dalglish, David Moyes, Andre Villas-Boas, Brendan Rodgers, Roy Hodgson, Owen Coyle, Alex McLeish and Steve Kean – had trained or taught at the town’s coaching courses. Over in Spain, Jose Mourinho – no longer needing a lager-stained touchscreen to prove his identity – was about to embark on a record-breaking, title-winning, Barcelona-baiting season with Real Madrid. England’s manager was Fabio Capello, who had been to the town in the 1980s to refine his coaching knowledge. Fellow Italian Giovanni Trapattoni, then manager of the Republic of Ireland, had made his own trip there the year before. Marcelo Lippi and Carlos Queiroz – both Largs attendees – were in the job market after guiding Italy and Portugal respectively in the previous year’s World Cup. These grand old men and bright young things had the same entry on their CV – a stint at a ramshackle country house perched between the green hills, wide sky and chill Firth of Clyde. 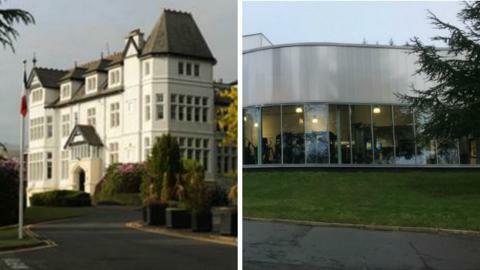 The Inverclyde National Sports Centre, where the courses took place, was originally built as a lavish home for local shipbuilder Robert Sinclair Scott in the 19th century. It was converted into a hotel in the 1920s, commandeered by the army in the Second World War, and finally bought by the Scottish Council for Physical Recreation in the 1950s. The resulting rambling pile was not what made it the place to be. The rooms for aspiring coaches ranged from bunk beds to basic. A system of bells, announcing communal meal times and summoning individuals to answer phone calls, was a schooldays throwback. There was an on-site bar, but the Kintyre Lounge – a gloomy, leather-and-oak affair – did not serve alcohol. Scotland’s fearsome reputation as a mould of managers – backed by the deeds of Sir Matt Busby, Jock Stein, Bill Shankly and increasingly Ferguson – was enough of an initial lure, but the centre did not rest on it. Andy Roxburgh, who was the Scottish Football Association’s director of coaching from 1975 until 1994 – when he became Uefa’s first technical director – hawkishly expanded its appeal on the continent. He used invites to various Uefa meetings to press the course’s merits and convince Europe’s most progressive tactical thinkers to come to Largs’ amphitheatre lecture hall. Craig Brown was the SFA’s technical director at the time. “The staff were the best managers that we had in Scotland – the likes of Sir Alex Ferguson and Jim McLean, who took Dundee United to the European Cup semi-final and Uefa Cup final,” he tells BBC Sport. “Andy Roxburgh was very resourceful and he brought the best in Europe to add to that, either to demonstrate or coach. He must take a lot of credit for making it an internationally renowned course. “We had Arrigo Sacchi, whose AC Milan side had been the best club side in Europe, come over. We had Richard Moller Nielsen, who had led Denmark to the European Championship in 1992. Franco Ferrari, who was one Italy’s best tactical coaches, Germany boss Berti Vogts. It wasn’t just dry theory. Largs was ahead of its time in its focus on managing individuals as well as teams. A university lecturer called Michael Fordham would run role-play situations in which prospective coaches would be confronted by a ‘player’ – acted out by Ferguson at times – who would rage against being dropped in industrial-grade language. The shell-shocked coach would have to use negotiation techniques – making sure the office desk was not a physical barrier between them, or reflecting criticism back as questions – to defuse the situation. Whether, in practice, such conversational jujutsu calmed things or inflamed them, those attending Largs understood a modern coach must wield the carrot, stick and tactics board equally adeptly. Students would find high-profile names alongside them, as well as at the front of the class. The course was regularly pitched to the Scotland team as a post-playing option. So, while south of the border the Football Association struggled to convince ageing stars to take their badges, Gary McAllister and Gordon Strachan headed back north to take up the SFA’s suggestion. Self-contained and secure, half a mile above Largs, the setting was ideal for the likes of Duncan Ferguson or Alan Shearer, who studied without scrutiny or interruption. That same seclusion bred a cabin-fever competitiveness among all those taking part. “With us staying at the centre, we were interacting socially, swapping ideas all the time,” says Gemmell, who also shared his course with former Republic of Ireland striker Tommy Coyne. It was not all serious though. One summer week, a staff team featuring the legendary Eusebio – invited to give his expertise on set-pieces – took on the students. On another surreal occasion, Hollywood actor Robert Duvall arrived to find inspiration for a forthcoming role as a Scottish football coach and promptly hired then Raith Rovers boss John McVeigh as his on-screen assistant. The sea air was a heady mix of inspiration, ambition and innovation. Largs changed coaches and careers, but coaches changed Largs as well. Barry Fleeting, son of Jim Fleeting – another of the senior coaches, was one of the teenagers used as training-field fodder. He would take instruction and surreptitiously spot stars as theory was translated into real-life training. “They always needed ‘runners’ to help simulate live matches,” he says. “I would be on study leave from school and get a lift up in my dad’s car and have Craig Levein, Alex McLeish or Jose Mourinho overseeing me as part of the course for a week or two. Most of the centre’s staff made the trip up from town every day, but business also flowed down the hill as well. For a seaside resort whose traditional summer custom had been siphoned off by sunshine package deals abroad, an influx of hungry and, more often thirsty, football coaches was welcome. With the students completing coursework most evenings, occasionally with the help of an obliging guesthouse owner, the course leaders led the way. The Clachan pub, now the Waterside, was a favourite watering hole. The tutors mixed with the locals in less predictable places as well. “Eddie Turnbull, who managed Hibernian and Aberdeen, was one of our most renowned tutors and he would have a ritual every night of heading down to the bingo hall in town,” says Brown. “He was a ferocious guy on the touchline, but he would sit down with all the old dears there. “I was sat next to him one evening and he turned to me and showed me he only needed one number more. Now, when you get all your numbers you are supposed to shout ‘House!’ and they come over and check your card. The bonds made on the course and in the pubs were long and fruitful. In the summer of 2012, former Porto goalkeeper Nuno Espirito Santo was impressed by a presentation from a young unknown Scot on his course. They stayed in contact and when Santo was hired at Portuguese side Rio Ave later that year, he installed Ian Cathro on his backroom staff. The pair continued their partnership at Valencia and are now manager and first-team coach respectively at Wolves. But they are among the last coaches off the Largs production line. As you walk out of town and up to the centre now, a very different building looms on the hill. Where once a stately white-fronted chateau stood, there is now an elegant curve of metal and glass. Parts of the old centre remain. The indoor hall and gymnastics facility are deep in the new structure’s belly. But a £12m redevelopment in 2017 has been a jolting gear change into the 21st century. The remaining links to Largs’ past are mostly human. Barry Fleeting is now in charge, and several of the 69 staff have an association stretching back decades. The whole building is fully accessible. Para-athletes can use it as easily as able-bodied. The assorted lifts, hoists and adaptable gym equipment mean the Great Britain boccia squad spent a daily 40 minutes – that would otherwise have been lost in logistics – training on a recent visit. It is still occasionally a base for future football stars. Ricky Sbragia, who did his coaching courses at Largs’ previous incarnation, has brought Manchester United’s Under-23s to stay on successive summers. But the courses that coached the coaches have migrated to Oriam, a new national performance centre on the outskirts of Edinburgh. Largs’ downfall came from the same qualities that made it a success. A location that fostered privacy and late-night idea-swapping was also inconvenient for much of the population. The legacy of success among its graduates was characterised by disaffected outsiders as a Bilderberg-style conspiracy. Some former players talked darkly of a ‘Largs Mafia’ after their own managerial aspirations failed to materialise. Perhaps ultimately, the model just fell out of fashion. The iconoclasts became the establishment. New schools of thought overtook Largs in the league tables. But the memories remain, even if the bricks and mortar have been levelled.